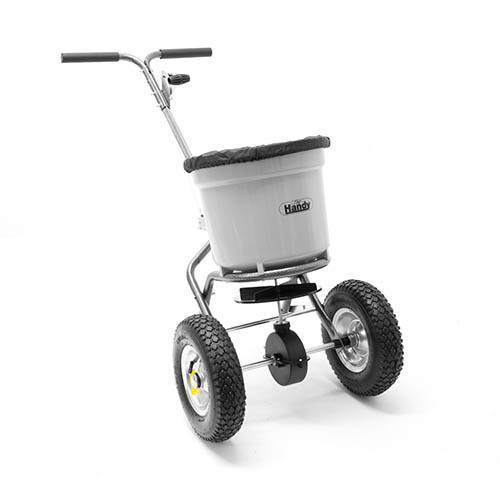 A tough, durable and easy to manoeuvre piece of garden equipment, The Handy 50lbs Fertiliser, Seed, Ice Melt Push Spreader, is a superb all-round spreader great for the distribution of lawn fertiliser between springtime and autumn or even during the winter to keep paths and driveway clear of ice. With a 50lb capacity hopper and an adjustable flow rate that can be controlled at the touch of a finger, this spreader is easy to use and makes light work of accurate distribution over large areas. The large pneumatic tyres make manoeuvring a breeze even over more rugged landscape and larger areas of lawn and the comfort grip t-bar handle makes the spreader comfortable to operate. Supplied with a rain cover and hopper screen to prevent clogging.